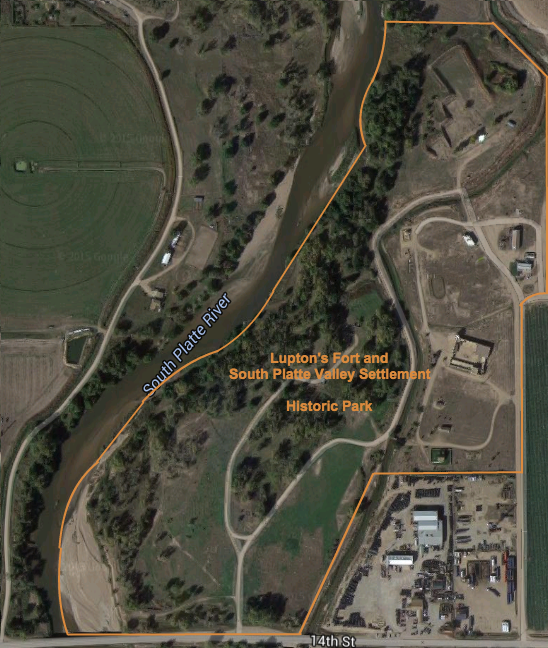 Historic Fort Lupton and South Platte Valley Settlement Historic Park encompasses 97 acres of land along the South Platte River just northwest of the city of Fort Lupton. The land consists of a large natural and camping area immediately along the river and a high bench of land where the original Fort Lancaster was located. Along the river, in groves of cottonwood trees are camping areas that can be used by Boy Scout and Girl Scout troops with reservations. These camping areas are also used by the re-enactment department of the SPVHS - the Tallow River Trappers - to hold periodic rendezvous events. Immediately along the river are nature areas that are home to deer, turkey, foxes and other animals and birds. 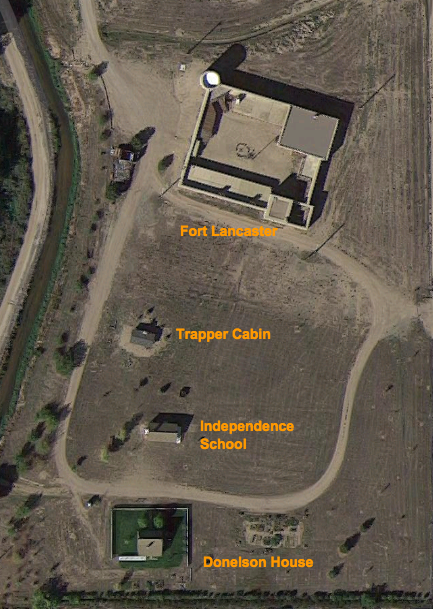 At the north end of the historic park is a muzzleloading shooting range leased by the Fort Lupton Muzzleloading Club. On the bench of land to the east of the rendezvous area is the location of the original Fort Lancaster and re-creation of Lupton's fort. Next to the fort are located a series of historic structures that represent a timeline for settlement in the South Platte Valley. Start your tour of the historic park at the re-creation of Fort Lancaster, which was in operation from 1836 to 1844. Move down the path and see the restored trapper cabin from the 1850's, which was originally located down along the Platte River in Adams County. Moving further down the path, your will see both the Independence School built in 1875 and the Donelson homestead house built in the 1860's. The Donelson House and the Independence School represent the settlement of the Platte Valley started by the early fur trappers and traders. The grounds and the fort can be rented for private events such as Boy Scout or Girls Scout encampments or weddings or retirement parties. See Private Events.